A homily preached by Rev. 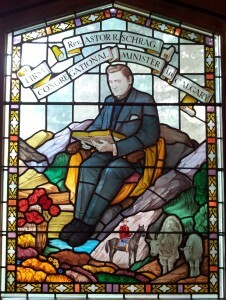 David M. Crawford at Rundle Memeorial United Church, Banff, on October 9/11 (Thanksgiving Sunday; part of a series of sermons on our stained glass windows). Based on Phillipians 4:4-7. As we continue with our sermon series on our stained glass windows, we come to the one depicting Rev. 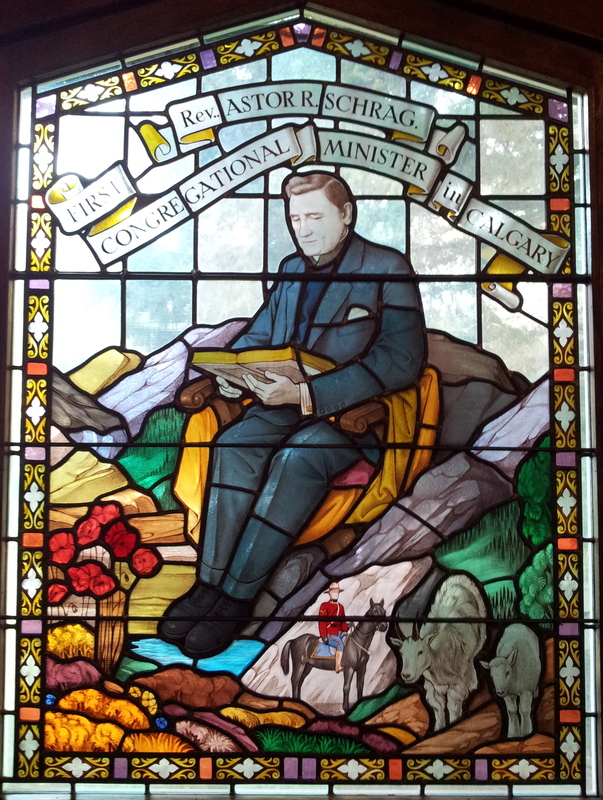 Astor Schrag, whom, we are reminded, was the first Congregational minister in Calgary, the Congregationalists making up one of the three original denominations that formed the United Church in 1925. We’ve already looked at the windows of John Wesley, John Calvin, and Isaac Watts. Today we move to the other side of the sanctuary and the corresponding denominational windows. Directly across from Isaac Watts, prominent Congregational hymn writer, is Rev. Schrag. We did discuss a bit of the roots of congregationalism last Sunday when looking at the Isaac Watts window so I won’t go into that today. Rather, and since it’s Thanksgiving, we’ll look at our lesson from Philippians. A well-known passage, a favourit for some, from the hand and spirit of the Apostle Paul. What wonderful words of guiance, of admonition, for any to attempt to manifest, even on a daily basis. Rejoicing in God! Practising gentleness! Avoiding worry! Praying often! Thanking God in everything! And the promise, then, of knowing, experiencing more, the peace of God! Is there a connection to be made between thanking God as a habit and knowing greater peace withint? I think ‘Yes’. I’ve got a good friend who always says, “Dave, we’ve got to focus on giving thanks for what we have rather than lamenting what we don’t have in life.” Not necessarily a new phrase, but true I think! Friends, do we cultivate in our lives a thankful heart, a grateful spirit, whether it’s Thanksgiving or a few days after Thanksgiving? Can we make the changes required in order to know better and more consistently the peace of God, which is beyond understanding yet not beyond our experiencing? As we come to the table in a few moments to offer our sacrifice of praise and thanksgiving to the God who has blessed us so abundantly in life, in Christ, may we remember with gratitude our forebearers, such as Rev. Schrag, and rededicate our lives to the Lord, giving thanks in everything for the Love that abides with us, in everything.